As promised, a picture of Mercilia's regular snow apparel. With the funds this Kickstarter helped raise, I'll be able to draw several outfits that are much more fitting for the environment and the setting. As well as all sorts of other cute (cool) things! Other than that I've given a lot of thought to recent requests for other stretch goals. A lot of them are about voice acting(a lot). I'm not against voice acting, but when I estimated the cost, I was looking at $30k total just in actor fees. Let alone editing and implementing these voices to every line of dialogue with the proper timing and length. The alternative is to only voice certain parts of the game. For instance, the prologue opening, and key events at the end. This means just auditioning two voice actresses for Mercilia and Seriva. Key scenes throughout the game will feature limited voice acting by a voice actor chosen for Mercilia and Seriva. The opening scene and ending scenes especially, and other scenes important enough for voice acting. Yea, I seem to get between Ilya, Iris or Maetel from Galaxy Express 999. I've changed the design slightly because I realized that white fur wasn't really matching the rest of the outfit, and I really wanted to create a connection with Queen Llend's outfit with the black fur. I'll show that in a bit! 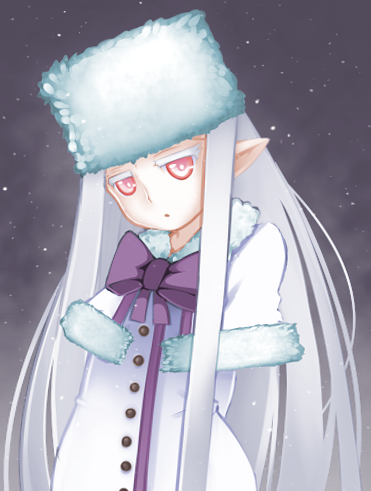 Mercilia's snow suit reminds me of FZ Irisviel. Looks great. Thanks for supporting the game. We actually have an editor, but understandably the demo didn't have everything we wanted in it, and we definitely had to rush at the end. I think that demo shows what a labor of love it is, even if it's incomplete and lacking all the bells and whistles I'd want to have in the game. My idea is to basically have two poses for each character, with two pose variations for, and a few different outfits. It's quite a bit of work, but I think it's definitely worth it. Congrats again on reaching your goals. I'm confident you'll get at least two of your stretch goals. Even if Vagabond doesn't make it this time, you can always wait until after the release of Dizzy Hearts to do a standalone KS for the 2nd game. I'm really hoping we at least reach the $11K mark to get some voice acting going. Concentrate all your firepower on making Dizzy Hearts a blockbuster of a visual novel from the western hemisphere, and people will definitely want more. Other than that I can't really think of anything. I'm just curious to see where the game goes and see if it breaks free from the archetypes of indy Japanese visual novels as this one aspires to do. I don't know if I have any constructive criticism to help the game along that you don't likely already know about. I know you mentioned adding more poses to the characters, with each character in the demo having only two. That's one crucial thing to expand upon. At least you have an easy system in place to interchange the facial expressions, unless you end up having special character portraits for important scenes. The game also needs someone to be the editor, making sure there's correct grammar, no awkward dialogue, no continuity mistakes,etc. I try to fund any visual novels that show promise (which is funny, since I don't read books hardly at all other than gobs of manga and occasionally comics), and this one has high potential. I wish I could get into writing things myself, but I was never much for descriptions. I remember an English professor having to give me an A- on a short story because the descriptions were lax even though he said the character development was some of the best writing he had ever seen. I guess visual novels or video games would be something right up my alley to write for. There should be more visual novels released and also made locally. I wish this project the best of success. Yea! I hope so too~ I'll add cool stretch goals as long as people want them. Let's see how far we can get this. I'm hoping pretty far.